Mania Territory For Gold is Coming Soon! 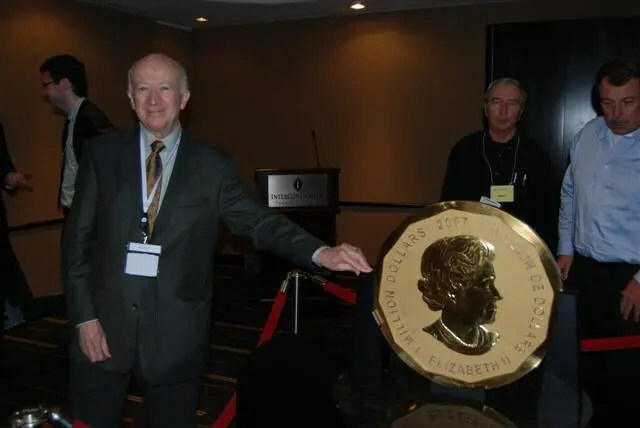 munKNEE.com Editor-in-Chief Lorimer Wilson with the world's first 100-kg, 99999 pure gold bullion coin with a $1 million face value. It was produced by The Royal Canadian Mint. 3. an opportunity exists for large and small investors alike to be buyers of gold bullion. Historically, the Fed has never hiked lending rates amid a weak jobs market. I would have to agree with Mr. Zyblock about gold heading into “bubble” territory at some stage. Since 2000, the gold bull market has been one of tempered enthusiasm with sizable calendar year gains in every year but nothing spectacular compared to palladium or tin [which have] more than doubled in value over the last 12 months. This has not been a mind-blowing bull market in gold; instead, it’s been a quiet or stealth secular rally within the confines of a steadily appreciating trend. It would seem plausible that by the time gold fetches prices far and above anyone’s imagination, which I believe is the possible outcome, the Fed and other governments will have already worked on introducing some sort of new exchange rate mechanism to stabilize the U.S. dollar. This might also coincide with a fully convertible Chinese currency, which would be bearish for the dollar. At that point, investors should start unloading [their holdings of gold]. That’s tomorrow’s story and tomorrow is a long way off. I suspect that as we continue to rally in the price of gold on the road to $2,500, or $3,800 for that matter [as] the Chinese morph into the biggest single source of demand for gold bullion… building their reserves the same way previous great global powers did in the 20th and 19th centuries. China doesn’t need all of these crummy USD and EUR. China is following the same path to economic prowess as her predecessors. The events played out in the United States from 1913 to 1971 and Great Britain from approximately 1750 to 1900 serve as a strong model for global investors. Previous Washington Politicians Will Cause Rampant Inflation With Their In-Action and Mis-Action! Next Here’s Why Agricultural Stocks Are a Better Buy!